Reviews of the Canon EOS 6D Mark II from around the web. The Canon EOS 6D Mark II is the company's latest full-frame DSLR aimed at advanced amateurs and enthusiasts, and even professionals looking for a second Canon DSLR body. Its all-new 26MP sensor has Dual Pixel technology for accurate autofocus during live view shooting, and it gains the same 45-point autofocus system from the crop-sensor EOS 80D for viewfinder shooting. A fully articulating touchscreen, built-in Wi-Fi and GPS capability, and 6.5 fps burst shooting round out the package. With the recent release of the Canon EOS 6D Mark II, there’s a new, junior full-frame DSLR for enthusiasts to get excited about. It positions itself below the EOS 5D Mark IV and above the EOS 7D Mark II, entering the market with a price of £1999.99 (body only). That the original Canon EOS 6D remains one of the most popular cameras on this site even at nearly 5 years of age (as of the 6D Mark II's introduction) attests to its value in the eyes of photographers. 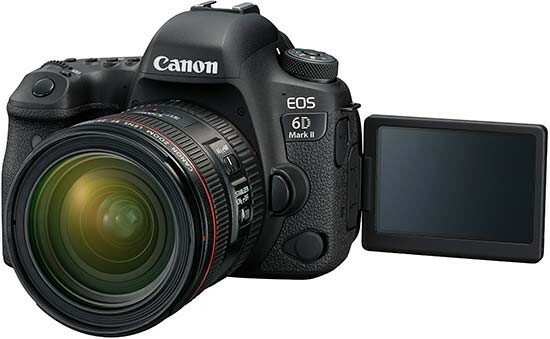 While maintaining the spirit of the original 6D, the Mark II comes with very significant upgrades including a current-technology-roll-up and it will have no problem taking the popularity handoff. While the 6D Mark II may be light on brand new camera features, it benefits heavily from existing ones and you are going to recognize many features from the excellent general-purpose EOS 80D inherited by this camera.